I just wanted to let you all know that I will be doing a free webinar next week on the topic of anxiety, if anyone is interested to listen in. Yes, it’s also true! We all have a similar inner landscape. When we try to process it together, we feel less alone in a chaotic world (both inner and outer), which gives us more strength and hope. Here’s the link and info for anyone who is interested! Anxiety is a feeling that I know all too well. I was given up for adoption when I was born, which led me to be extremely sensitive from a young age. My mother who adopted and raised me – who I loved with all of my heart – struggled with mental illness. As I watched her suffer through the torment of her own mind through the years, I developed a desperate desire for all people to have peace, including myself. I kept feeling that there must be a way to be free from emotional pain. And I began to dream of a healthy world where we co-existed as a happy and peaceful humanity. Discovering and recovering my own peace has been a long, beautiful, painful, dramatic and illuminating journey, full of ups and downs, laughter and tears. It is a journey that I am still very much walking, and one that I am very grateful for. I have come to deeply understand inner worlds and how similar our internal struggles can be, even if we feel all alone! Overcoming the feelings of anxiety may seem impossible, but we just need to take the time to get to know ourselves and do some serious organizing. You don’t have to live as a victim of your inner and outer worlds. There is a great power and possibility within you. Let’s find it! Let’s live it! I hope you can join me for my live class where I’ll talk about understanding the root of anxiety and how to process it, based on my experience. [August 21st @ 5:30pm PT / 8:30 ET, Free to Join] The class will be interactive so I will take any questions that you may have while watching the class. >> Click here to join my live class. Thank you so much, and remember, you are not alone! As mentioned in my last post, here is a podcast that I did with Linda Yoon from CHANGE TV on the topic of loneliness. 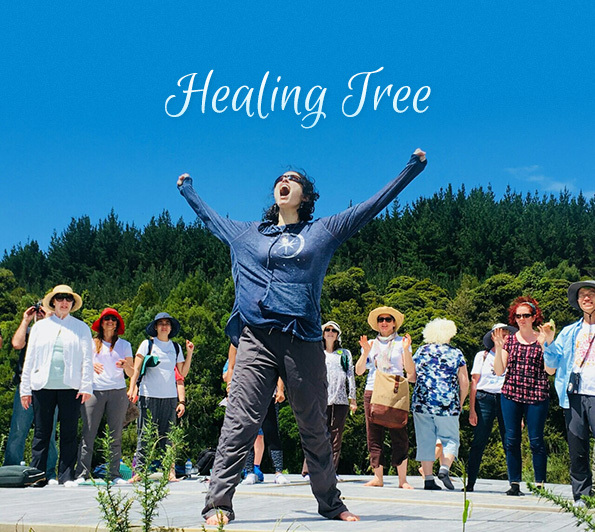 I’m not sure if you will find it useful or enjoyable, as it is a different modality than we usually have here on Healing Tree, but different and new is good! I feel that there is much to explore about this feeling, but the podcast touches on some of the important places to begin that process. Please feel free to share here or ask if you have any other questions on the subject. Recently, my brother Ian was encouraging me to write poetry. He always reminds me that he loved the poetry I wrote when I was younger and urges me to continue doing it. However, sometimes there’s just nothing there, you know? It’s not that I don’t have things to write about because I am always filled with feelings, awarenesses and reflections, but sometimes those synapses are just not firing when I look at the paper. Now here I am, sharing what we came up with! Longing for something that I already am, longing for a place where I already am. The story that is the reality where I live….exhausts me…. If I have to live and die like this, I’m not sure if I can forgive myself. But to think like that, fuels my story even more…. Can I surrender my precious pitiful empty story? Can I be brave enough to face the vast loneliness that unveils when that story is peeled away? Perhaps it is true of all of history, of the entire human race – we are all just bunnies running away from the tiger of loneliness, not realizing that it’s just a paper tiger, after all. Interestingly, just a week ago I was invited by Linda Yoonjin of Change TV to do a podcast with her, chatting on the topic of ‘loneliness.’ I will be posting that podcast here as soon as it comes out for the public. So, more on the topic of loneliness to come…. Thank you Ian for knocking on the dusty door of my inner poet once again and inspiring her into action! How would you answer the question: What is the opposite of fear? For me, there are different answers on different days, depending on what I’m experiencing and where I’m at in my journey. Sometimes the answer is Love. Sometimes the answer is Courage. Today, I feel that the opposite of fear is Absolute Acceptance. Accept everything. Accept what the moment brings to me. Who said it should be any other way? Why do we put so many expectations on life? Life should be like this and it shouldn’t be like that. He’s supposed to do this and she’s supposed to do that. I’m not supposed to be like this, it’s not supposed to be this way…and so on and so on. Have you ever taken a look at how many should’s and supposed to’s that you are projecting onto each and every moment? The problem is that we are mostly doing it unconsciously. But I invite you to bring it into your conscious awareness. It may be painful, yet I still invite you to do it. It’s when we finally see the truth of our habits that we have the opportunity to change. Life is life. But I put my expectations on it. Then, when life doesn’t match my expectations, I suffer. Isn’t it so? Let’s check our expectations carefully. I believe that they are causing us pain. But the good news is: Although we cannot change the current of life, we can change ourselves and our expectations of it. We can change our perspective. We can let go of our demands on life and just lean into it AS IT IS. Is this easy to do? No way! But will it bring us more peace? Yes, definitely. I have heard some call this “radical acceptance”. I want to call it “absolute acceptance.” Absolutely accept every single thing as it is. Look into your own heart and find the judgement, expectation and “should” that you put onto yourself, your situation, or the person involved in it. Let’s stop demanding from life. It’s stressing us out and disabling us from being ALIVE. Let’s start in small doses – just a moment here or there when you can grab hold of this perspective. Awaken the calmly observing eye within you that is watching life through you without any commentary of goods and bads, rights and wrongs. I’m not saying to stay there always because that will lead to disappointment in yourself. Instead, take it easy and slow… just try to begin the process of waking it up. That eye is always open, but we couldn’t allow ourselves to see from it because we were so busy judging ourselves and our innocent lives. And why? With what and whose standards have we been judging with? I believe this is an important thing to consider in our journey of awakening. What are you discovering, uncovering about yourself these days? As the earth turns, as summer rolls by, as good news and bad news come and go from the world around us…. what are you seeing about yourself? How are you changing? Isn’t that the duty and purpose of our existence as human beings? To at least keep changing and growing ourselves with sincere effort to evolve into the best people that we can be? Even as I type that here, I find myself breathing out with a sigh of great relief. Isn’t it such good news? It’s even the smallest things that we shift in life – just breaking out of the mold of our old habits the slightest bit- that makes us feel proud of ourselves and our brains start to produce positive messages. I love the above quote. Simple but true. It makes me thing of another thing that Ilchi Lee always says: Good news makes a good brain. This is one of the key principles of how to have a healthy, optimal-functioning Brain Operating System. Just as negative information is like toxic poison for our spirit, which then slowly seeps into our minds and bodies affecting our health, positive messages become medicine for us! How are you? Are you feeling bright and hopeful these days? Or do many concerns of your life and your world weigh you down? It’s been a long time for me to write. I have been missing Healingtree. I have been so deeply immersed in my own process that it’s been difficult for me to come up for air to write. My true value is the sky and the trees. Therefore, I must always stand tall with a shining spirit in order to protect that value. I must, with great courage, let go of my “self” who blocks that value, but who is not really me. It’s so easy, yet so complicated. It seems that the ego would do everything in it’s power to distract me from the very truth of my existence. However, maybe if I just let that ego of mine run its wheels long enough, it will lose it’s steam and finally surrender. I must stay positive and awake. Love is medicine. To know my value is true love for myself and only when I do that can I truly love others. Because loving others is seeing their value, isn’t it? And when I see my value, I can see their value. And vice versa. Because we are one. It’s all very beautiful. Even suffering and failure can be beautiful. And we must do even those things – suffer and fail- with bravery. I hope that my reflections are useful to you who is reading this! I would love to hear your reflections too. I am in the Earth Village in New Zealand, doing a “Self-Declaration,” overlooking a huge valley of forest that looks much like the one you see behind me. Because where we were was so very quiet and remote, our declarations echoed back to us, leaving us feeling invigorated and empowered. As I stood in front of the vast landscape, I felt my heart beating passionately before Mother Earth. I asked my heart what it wanted to declare before this Great expanse of Life. I was feeling very small, humbled, and grateful – in a good way 🙂 . What came out from my soul was: I AM FREE! Free from the illusory prison of my thoughts, my beliefs, my emotions. My fears and my stories. My judgements and reactions. Free. Free from my desires to control and be safe. Free from any moment when I forget that I am already Love Itself and Life Itself. Free. Free to be who I truly am. Free to live as I choose. Free from the construct of my own Egoic Mind and from the sickness of society’s collective Egoic Mind and unhealthy information field. Free. Free to live joyfully and peacefully as a daughter of Heaven and Earth. Free to Love. Free to be Brave. Free to create my dream and do my very best for this planet and this humanity while I live and breathe this life. I was feeling all of those things as I shouted loudly in the Earth Village that day. I love this picture, because it takes me back to that moment, when my heart was full of courage and my soul’s wish was singing, and for a moment in time there was nothing else inside of me but that. And the trees listened with stillness, but I knew that they heard me and they felt me. In that sacred time and space, all was truly well. I am deeply thankful for all that I received from the Earth Village. Indescribable gifts of understanding, acceptance, support and embrace. I pray that with my life I can give back to our Mother Earth even 1/10th of what she has given to me. Thank you Mago (Ancient Mother, Mother Earth). I love you. During the time of our tour in February, a producer and his camera men from a Korean broadcasting station were there, following us around on the second half of the tour. This station, known as KBS (which might actually stand for Korean Broadcasting Station, but I’m not really sure), is one of the most well-known and popular stations in Korea. It was a great honor that they wanted to do a little segment on New Zealand, the power of alternative healing, kigong, Body & Brain Yoga and Ilchi Lee. Finally, the clip was translated into English and I found it so beautifully done ~ capturing New Zealand and some of my experiences there so wonderfully! When I saw it, I felt that it was an opportunity to go back in time and take some of you with me!!! So, I wanted to share it with you. I invite you to sit back, relax and really take in the refreshing spirit of this sacred land…..
Close your eyes and slowly inhale and exhale. Now focus your mind on your chest and heart. Imagine breathing life energy into the soul in your heart. Feel your breath gradually deepening as your body and mind relax. Forget special breathing methods and just breathe however your soul wants. You’ll find a rhythm for your breathing after a while. As you inhale, imagine the life energy of the cosmos entering your body, awakening the energy of your soul in your chest. You’ll feel your heart gradually filling with warmth and peace — the pure energy in your heart, the feeling of your soul. Feeling the soul is never difficult. Just let yourself be breath itself. In the past, I have also talked about using breathing as a form of acceptance. Through breathing we can let go of our heavy thoughts and judgements and settle into the present moment. We can feel the Great Okayness of nature and the universe, of who and what we truly are. We can restore ourselves with the life energy that is always there for us when we take time to simply focus and feel. What a gift! Let’s not overlook a tool so simple and so accessible, given to us with this human body ~ reminding us of where we came from. As I write this to you, I remind myself…. let’s breathe well!